We are pleased to offer this comfortable, 5 bedroom, 4 bath, home located in Harpswell. 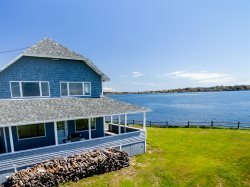 Enjoy panoramic views of Harpswell Sound from this stylish home, with 300 feet of oceanfront and a four season heated solarium. The house has a casual and relaxed feel to it, offering beautiful coastal decor. The main floor offers an open floor plan with kitchen, dining, and living room where all the family and guests can congregate. In the solarium, there are comfortable furnishings, with a ceiling fan and an entrance to the deck. The kitchen is well appointed with items to prepare all that Maine has to offer; from lobsters to items fresh from the local farmers market. Three of the five bedrooms are located on the main floor, which includes a master bedroom with a bath en-suite, a second bedroom with a queen size bed, a smaller bedroom with a full size futon, and there is a shared full bathroom with a shower at the end of the hall. The fourth bedroom is located on the ground level along with the laundry area, full bath with a shower/tub combo, a family room with a pool table and an additional room with a ping pong table. Last, but most certainly not least, a newly added Master Suite (fifth bedroom) is located on the private second floor, offering a king bed, a shower and separate tub, all opening to a large balcony with elevated views of Harpswell Sound-- truly picturesque. Take a rainy day and start a family challenge on the ping pong or pool table in the family room. The house is fully stocked with plenty of board and trivia games. Outside you will find lush greens and a beautiful lawn, which lead you to the deck and stairs to the water. On the deck is a gas grill and lobster cooker. Gentle sloping landscape to the shore, from the stairs, allow for easy kayak launch or swimming. Enjoy your morning coffee on the deck, from this southeasterly facing property, for unmatched sunrises over Harpswell Sound. Let Mingo Cove host your next Maine summer vacation! The house has amazing views and is perfect for hosting meals outside. Its a bit steep and rocky to get to the water, but its also possible to enter even when the tide is low. Its a great spot for swimmers.